When a prostate cancer has metastasised or spread, it has sent metastases elsewhere in the body, typically into the bones or lymph nodes. If the biological characteristics of the cancer and the risk factors give rise to suspicions that the cancer may have spread (metastasised) via the lymphatic system into the lymph nodes or, most commonly, into the bones, we will stage the cancer before making a final treatment decision. 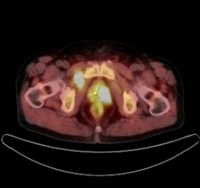 In positron emission tomography-computed tomography (PET-CT), a radioactive tracer is used to examine metabolic differentiation in the body. Because the radioactive tracer seeks out hypermetabolic areas, such as cancer cells, a pronounced infiltration is deemed abnormal in an area where infiltrations are not usually found. Traditionally, staging has involved a contrast medium-enhanced CT scan of the whole body and a bone scan with a gamma camera. Often, the accuracy of cancer staging with CT can be improved through the use of radiotracers, such as 18-F choline. Their use is based on the metabolism of prostate cancer. Sodium fluoride (NaF) is a sensitive tracer for bone scanning. The doctor always selects the PET tracer on an individual basis. The permanent staff at Docrates include a radiologist specialised in cancer imaging and a nuclear medicine specialist. This is to ensure uninterrupted and instantaneous dialogue between the imaging experts and attending doctors. FCH PET-CT examination offers a proper understanding of prostate cancer metastasis.